In the United States, issues of immigration have often been tied to questions of civil rights. Beginning in colonial times, immigration had a profound (and generally negative) effect on the lives of Native Americans. The transatlantic slave trade was a means of forced immigration that profoundly shaped U.S. attitudes on civil rights. Today’s understanding of the civil rights of immigrants has its roots in the Fourteenth Amendment to the U.S. Constitution, which guarantees rights for “any person” within the U.S., including equal protection under U.S. laws. During the 20th century, shifting views on race among America’s white majority shaped policies around both immigration and civil rights. Inspired in part by eugenicist theories of inferior and superior races groups, the harsh Immigration Act of 1924 implemented a quota system for countries in the Eastern Hemisphere, effectively banning immigration from China, Korea, and the Philippines and severely limiting the flow of migrants from southern and eastern Europe. Between 1900 and 1910, for example, an estimated 200,000 Italian immigrants arrived each year in the U.S. After the 1924 law went into effect, that number dropped to around 4,000. The Immigration and Nationality Act of 1965, which replaced the quotas with a system of preferences that favored family member migration, was part of a series of sweeping laws — including the Civil Rights Act of 1964 and the Voting Rights Act of 1965 — that sought to realign U.S. policies with changing views on the rights of minorities. Today, lawful permanent residents of the U.S. have the right to return to the U.S. after traveling abroad, and can qualify for certain government benefits. Any person in the U.S., whatever their status, is allowed to bring claims in U.S. courts. 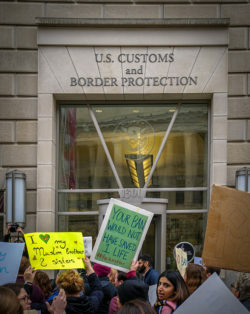 Immigration and immigrants’ rights remain a hot-button issue in contemporary politics, with civil rights activists pushing for greater protections of immigrants, especially those without legal status, and anti-immigration activists concerned that enforcing or extending civil rights protections for all immigrants will cause social or economic effects that they find undesirable.